Reading a prepared statement, Mark Driscoll told the Bellevue campus of the Mars Hill Church congregation this morning that he will take at least six weeks off as lead pastor of Mars Hill Church while charges against him are investigated. Driscoll preached at Bellevue at 8:30 am to a packed house. According to sources in church this morning, Driscoll said he is meeting with mature Christian men unrelated to the church. The message is being played at other locations this morning. Earlier this month, Driscoll and Mars Hill Church were removed from the membership of Acts 29 Network. The board of Acts 29 called on Driscoll to step down from the church. On Thursday, it became known that 21 former Mars Hill pastors had filed charges against Mark Driscoll. Friday, the New York Times chronicled the implosion of Mars Hill over the last several months. Pressure had been mounting on Driscoll to address the adverse events. Mars Hill Church has posted the transcript of Driscoll’s statement and a video to their YouTube account (embedded at the end of the post). The audio above was from a location other than Bellevue and was recorded from the video shown there. Driscoll delivered the speech in person at the Bellevue location. The video below was recorded there and is somewhat longer due to the personal nature of the delivery. Driscoll mentioned the charges brought by 21 former elders. He indicated that the charges would be examined. 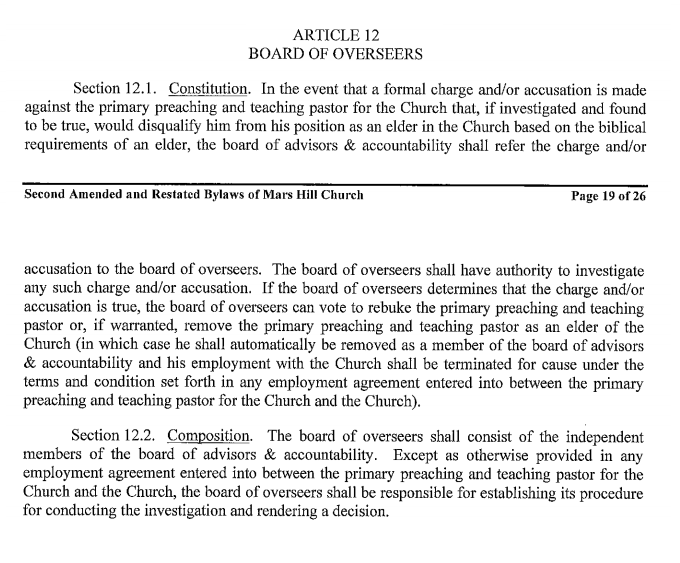 What needs to be very clear is that the current by-laws of Mars Hill Church do not give the elders the authority to examine these charges. The independent members of the Board of Advisors and Accountability is in charge of the process. The current elders do not have the ability to vote on Mark Driscoll’s status at the church. Currently, Michael Van Skaik, and Larry Osborne are the two independent members of the BOAA. Unless Mark Driscoll’s employment contract adds an unknown wrinkle to this process, the two BOAA members Van Skaik and Osborne will have the responsibility of investigating the charges. So let me tell you what I plan to do in the days and weeks ahead to help us move forward as a church family. During this time Pastor Dave and our lead pastors will share the preaching responsibilities, along with their other pastoral responsibilities. I am grateful that we have a team of godly leaders that are trustworthy and love you. They will continue in 1 John for our series “Love One Another”. I will use this time to continue to seek the Lord about His plans for me and for this and the next season of life for Mars Hill. I will also use it to spend more time with God, my wife, and our children. I have asked our Board of Advisors and Accountability to strengthen our board by adding members to it, and they are in the process of doing so with local members being our first choice. Other media have interesting details to add. For instance, Sarah Bailey at Religion News Service disclosed that public relations expert Mark DeMoss was in the audience and has been retained to assist the church. Morgan Lee at Christianity Today has an extensive write up. Michael Paulson, writing in The New York Times, followed up today on his front page article published yesterday. There is a lot to discuss after this announcement. To some, this will seem like a statement of repentance; to others, it glosses over numerous issues which have yet to be acknowledged. There were some criticisms of social media that were unfair given the fact that Mars Hill Church avoids addressing legitimate questions and has willfully withheld information that a church should divulge. Tomorrow many of those issues will still be there. I’ll have more on this announcement through the day. 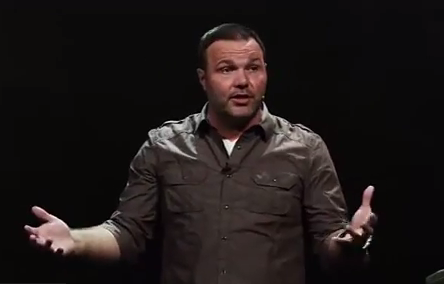 Next Next post: The Charges Against Mark Driscoll: What Happens Now?